Lake Kerinci lies at the foot of Mount Raja, in the district of Kerinci Lake and Keliling Danau District, Kerinci Regency, Jambi Province. In Jambi, Kerinci is the largest lake with an area of 4,200 hectares with a depth of 110 meters, while its height reaches 783 meters above sea level and the diameter along 70 Km. According to geologists, Kerinci Lake is part of the valley in Mount Kerinci. The valley is then formed as a small eruption caused by the volcano and a decrease in the Bukit Barisan Mountains. 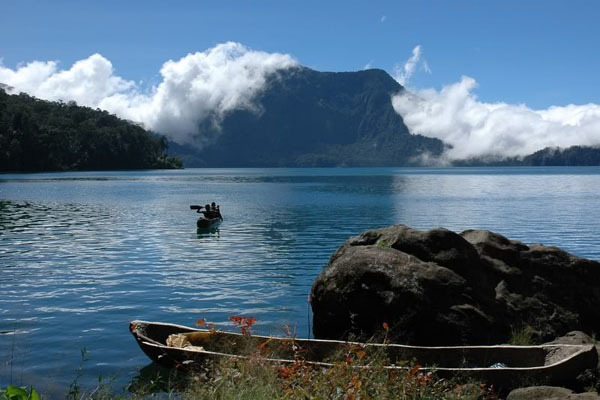 Danau Kerinci spans 4,200 hectares and reaches a depth of 110 meters. A number of stone megalithic relics have been discovered in the small villages scattered around the shore of Kerinci, some dating back to 2,000 years ago. The presence of these ancient standing stones shows this area as one that has been inhabited for thousands of years. In addition to the very charming scenery, the lake also serves as one of the water resources in Kerinci regency and Jambi province. The water in the lake is able to supply the water needs of the community, both for agriculture and drinking water needs. The beauty of Kerinci has long been associated with legend about twin orphan brothers, name Calupat and Calungga, who found shelter at the foot of Mount Kerinci. Two precious stones had been given to them by their late parents; a ruby and a pearl. One day, while hunting alone, Calungga came upon a giant egg. This egg was meant to be brought home and shared with his younger brother, Calupat, but instead, Calungga ate the egg alone. Immediately afterwards, Calungga was overcome with extreme thirst. He ran to the river which flowed near Mount Kerinci and drank until the river ran dry.But yet his thirst was not quenched. Suddenly, his body began to change. He grew larger, longer, developing golden scales along the length of his body. Calungga had transformed into a giant dragon with the gem stones he had been given embedded in his head. Dragons, as we know, are magical creatures, and so to test his powers, Calungga appealed to the gods of the earth. He wound his snake-like body into a large circle and begged the gods to fill that shape with water. The gods obliged, creating Lake Bento at the foot of Mount Kerinci. Unable to live alone, Calupat asked the dragon to bring residents to his valley. A powerful wind then blew against Lake Bento forming an estuary and causing the river to flow downstream to the east. Lake Bento was again left as an empty valley, and a new river was created: Lake Kerinci. With the presence of the lake, people began to settle around its banks. Upon visiting this spot today, you can still see the shape of Calupat sitting upon the head of a dragon. The lake is located in the Kerinci Valley, about 16 kilometers from Sungai Penuh. The two closest cities to Sungai Penuh, capital city of Kerinci District, are Jambi and Padang. Getting to Sungai Penuh from Jambi city takes about 10 hours by car over a distance of approximately 500 km. This can be done by using public transportation or rental car. Jambi airport serves just Jakarta and Batam. The alternative route through Padang is much faster, at a total distance of under 300 kilometers. Sungai Penuh can be reached via public transport, car rental or private car, and should take between 5-6 hours. Minangkabau International Airport in Padang serves Jakarta, Medan, Pekanbaru, Batam and Kuala Lumpur.